King Tut was a boy king in ancient Egypt. He began his rule when he was just a child, and he died when he was only 18 years old. However, he has lived forever in history, as we still talk about him today! He left behind an impressive tomb filled with all sorts of golden treasures, and many items from his life. Through the things found in his tomb, we’ve been able to learn a lot about ancient Egypt. You can read more about Tutankhamen here. 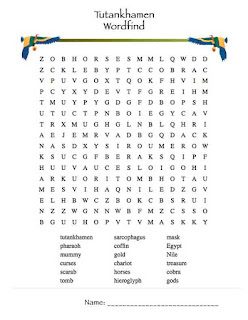 How many words can you find in this puzzle about Pharaoh Tutankhamen, also known as 'King Tut'?